This is a wonderful drawing. I can just "feel" that handbag. How long did this take you to sketch? The detail is amazing and the bag looks so soft. Wonderful sketch! Simply beautiful! You could see the awesome craftsmanship of the bag in your pencil work :) how amazing is that!!!! Fabulous sketch! Very well done! Thanks everyone, it took a few hours Patsy but I did go back a couple of days later and improve the stitching. I like to do a drawing and look at it a while later, it gives you a fresh view of it. 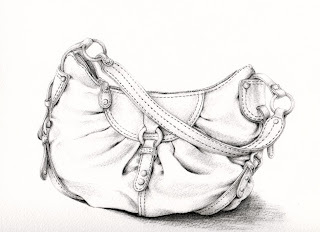 This is a great drawing, and a great handbag (and a great gift too). Well done! this is gorgeous!!!!! i LOVE the way you draw!!! !